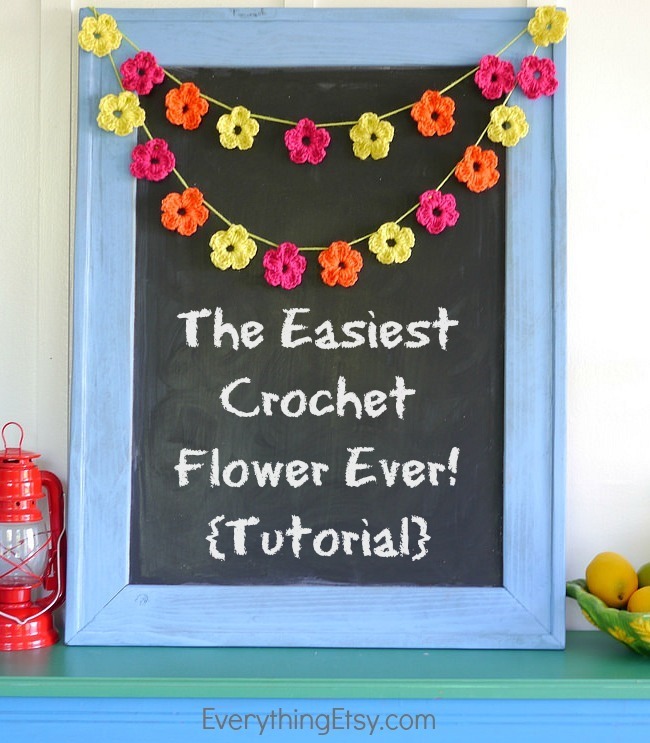 You are here: Home / Tutorials / The Easiest Crochet Flower Pattern Ever! 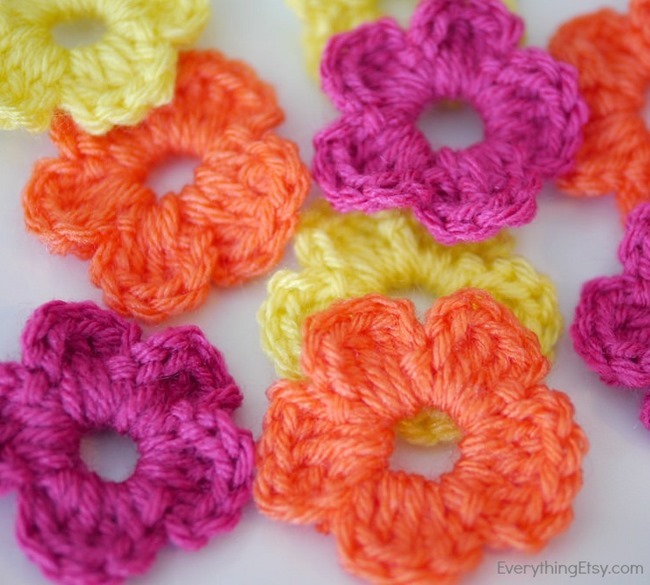 This is the easiest crochet flower pattern ever! I made a batch of colorful crochet flowers and strung them together to create a little flower bunting. I like to keep my crochet projects as easy as they can be since I have a short attention span. You can be a complete beginner and make these flowers. Basic crochet knowledge of a few simple stitches and you’re all set. You can practically make these with your eyes closed…well, maybe. I made a ton while watching a movie and hung them on a chalkboard Tim made me years ago. 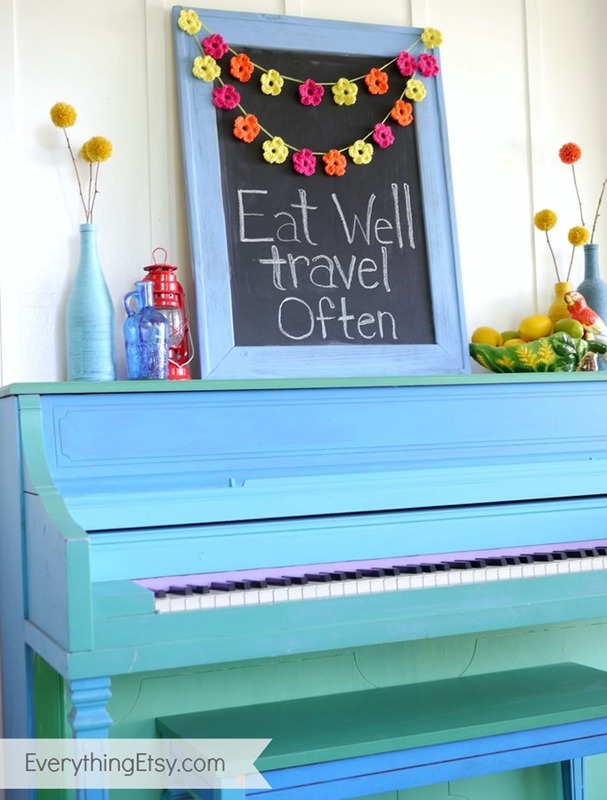 They look fabulous decorating the top of my colorful piano! 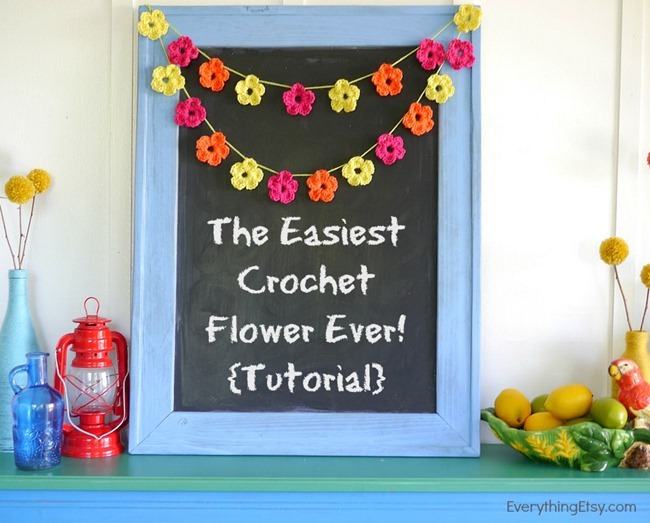 A chalkboard and crochet bunting is a winning combination in my book…it’s so simple and sweet. Slip stitch into the first stitch – This makes the center circle. Repeat Step 2-6 four more times to create the remaining petals. Tie it off and you have a simply sweet flower. Make a ton of them and use up your stash of leftover yarn. Or buy your favorite colors…any excuse to buy pretty yarn is acceptable, right? String them up for flower bunting or decorate a gift. Wouldn’t they make a package extra special?? I totally think so and I’m trying that next. There’re a million ways you can use these, and it’s the perfect flower for beginners! It would make a great craft for a summer camp full of girls. That would be fun! My husband said they reminded him of sugar cookie when he was little…it always goes back to food. HA! I hope you’ll try it! I’d love to hear what you do with them. 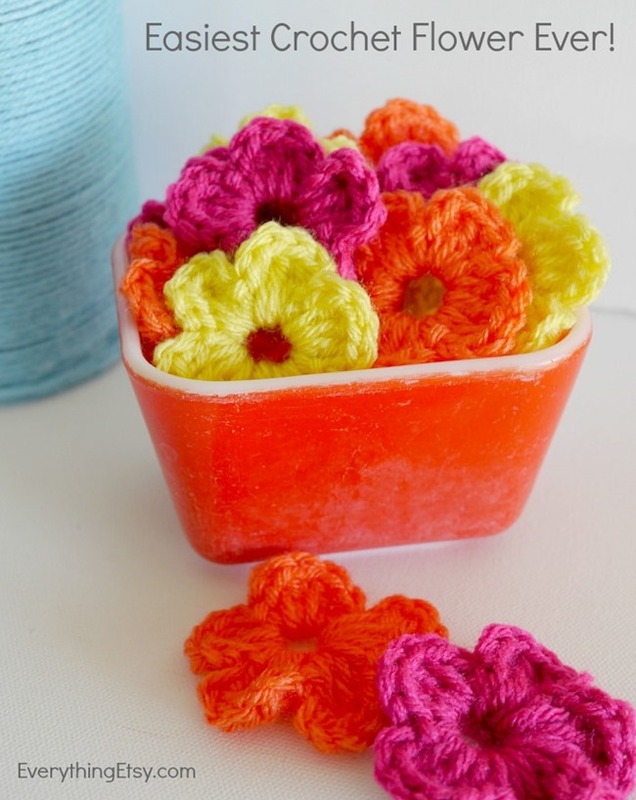 Looking for more crochet flower inspiration?? Check out this post…10 Simple Crochet Patterns! Love, love this! My mind is racing about ways to use them. These are adorable! I’d use them for hair accessories in little girls and for embellishments on skirts. Thanks for sharing! Hi Miss M! No worries…I’m sure you can do it! Every stitch goes into the little circle you make from the first few stitches. It might seem kind of tight to work with, but keep working your way around all the petals. Then you can pull on it a bit to make it look just right. I had the same question ….. I figured out that if you double crochet in the center hole, it looks pretty close. The trouble comes when you state ‘slip stitch into first stitch’. You mean the last stitch to create a circle. The first stitch is next to the hook. Should be the last stitch. I’m just starting to teach my two grand daughters to crochet and these are the perfect first project for them! These are so simple and they are something that they can finish easily so that they can know that they can actually use the stuff they are learning to make cute things. Thank you so much! Thank you so much for sharing your flower design! Your little projects have started a whole new way of decorating in my Family Room! It started with Valentines which are going to turn into Easter decorations in a candy dish. Made some shamrocks decorated with pearls and now I can make some flowers to go with a Spring pillow that I bought from CVS! Can’t wait to see if you design a pumpkin for Halloween. Can you tell that I used to be a Pre-School teacher? Hi, Is this written using UK or US crochet terms please? Could I ask WHY you are not on Ravelry?? I love all your designs also the videos which has helped me a lot. So many people love what I’ve made in the passed but can not find you or your patterns on Ravelry. so we have to include the url where to find your patterns. Love the hearts and Flowers – Great idea on string them together for the flowers. I ‘m also making up cup cozies as well – Hearts and Flowers. Previous Post 25 DIY Hair Accessories to Make Now!